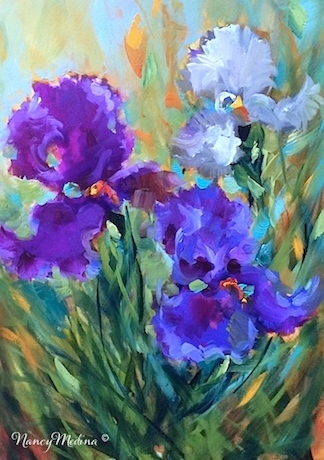 The purple irises in my garden are flagging, waving about in the breeze, trying their best to compete with their brilliant blue neighbors, my hydrangeas. However, the season for irises is flying by, and their rivals the hydrangeas are well on their way to glory days. My palette leans toward cool greens and warm red violets in the spring, reflecting exactly what nature is painting in her own garden in my back yard. Here's a tip on how you can mix brilliant purples. First of all, be sure you're using professional quality paint, whether you paint in oil, acrylic or watercolor. Student grade paints will not give you the jewel tones we all crave. One of my favorite color combinations is magenta and a touch of ultramarine blue. Split that combination in two, and add a good quality white to your second pile. You can continue forward, making additional values up and down the scale, adding white on one end, and even experimenting with your own recipes. Sometimes I substitute ice blue for white, sometimes I substitute naples yellow light for white. By staining your canvas first with a transparent purple such as magenta, you lay the foundation of a jewel tone that will glow through at the end, if you are careful not to cover every inch of your canvas with opaque paint. You'll see exactly how I put this into practice in my new online video lesson on blue lace hydrangeas, which will be launching in the next 2 weeks. Stay tuned here to the art bloggy for the scoop, and warm up your brushes, let's scoop up luscious piles of purples and blues and ring in spring together!